Are you feeling lost? Hopeless? Bewildered? 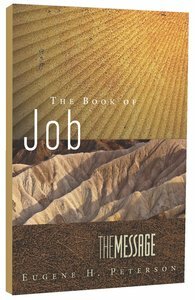 Translated into American English by pastor and scholar Eugene H. Peterson, The Message Job invites us to ask the difficult questions that arise when life seems to be spinning out of control. When things become chaotic, we don't need pat answers; we need the relief and comfort that come from God himself, speaking to us out of the whirlwind.